Home / Freebies / Free Stuff Online / Giveaways / Reminder | VeggieTales Easter Collection Giveaway! Don’t forget to enter to WIN the VeggieTales Easter Collection! We are giving away 3 copies and the last chance to enter the Giveaway is Friday, March 1, 2013 by 3 p.m. EST! 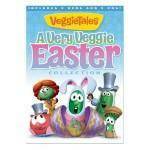 I have a review of the VeggieTales Easter Collection that I want to share with you. I love VeggieTales! I am excited to tell you that we are offering 3 readers a chance to win A Very Veggie Easter Collection! A Very Veggie Easter Collection contains 2 popular Easter DVDs “Twas the Night Before Easter” and “An Easter Carol.” Additionally, this set includes 2 popular CDs – “A Very Veggie Easter” and “Hosanna!” Plus the Easter CDs include some very special guests (Amy Grant and Mark Hall)! This is a perfect gift for Easter! I usually preview or watch right along with my kids the movies they watch. I have never found anything in a VeggieTales DVD to be questionable. Mostly, I just love the messages that are conveyed in these movies. They teach kids lessons in a way they can understand and I truly think they are just wonderful. This particular VeggieTales DVD is inspired by Dickens’ Christmas classic, this very special VeggieTales film explains why millions of Christians around the world celebrate Easter past, present and future. I like to get my kids a little gift for holidays. So for Valentine’s Day they each got a goodie bag and then they got to share the VeggieTales DVD “Lettuce Love One Another.” For Easter, the same thing will happen, they’ll get “A Very Veggie Easter Collection” to share! My daughter is 3 and she absolutely loves VeggieTales! A few places you can purchase this DVD are amazon.com and walmart.com. All Giveaways will end at 3:00 pm EST on 3/1/13. Winners will be selected at Random and notified by email. You will have 48 hours to respond to the email to claim your prize. I received both a sample product and product to giveaway in exchange for hosting this giveaway from Big Idea Entertainment however all reviews and opinions are mine and are not influenced by receipt of product. Others may have a different experience. Open Only to US Residents age 18 or Older. Alternative Entry Method: Mail a 3×5 Card with your Name, Address and Phone Number to P.o. Box 8622, Springdale, AR 72762. Entry must be received by 3/1/13. Void where prohibited & Not Valid in All States. Maybelline Coupons | FREE Eyeliner & Shadow at Dollar Tree!